More details on Steven Spielberg’s upcoming ghost and UFO based social network, which we first wrote about in early March and followed up with additional details a week later. The site will reportedly be called “Rising” or “The Rising” (our understanding is that they have acquired both .com domain names), and the logo above and animated logo below are at least preliminary versions of the final. We originally heard that The Rising is being created in partnership with Windsor Media, Terry Semel’s investment firm, but we still haven’t gotten confirmation of their involvement. Windsor was created by Semel before he went to Yahoo, was put on hold during his tenure there, and fired up again after his departure last year. 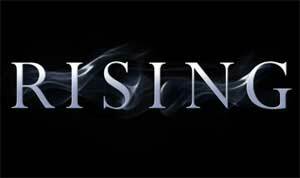 The Rising will have original video content with a permanent host in addition to the social network where users can share stories and experiences, tapping into serious demand for this kind of thing. There are thousands of forums dedicated to paranormal and UFO topics today – among them is, yes, a Meetup site for ghost trackers. Rumored launch date is this summer.